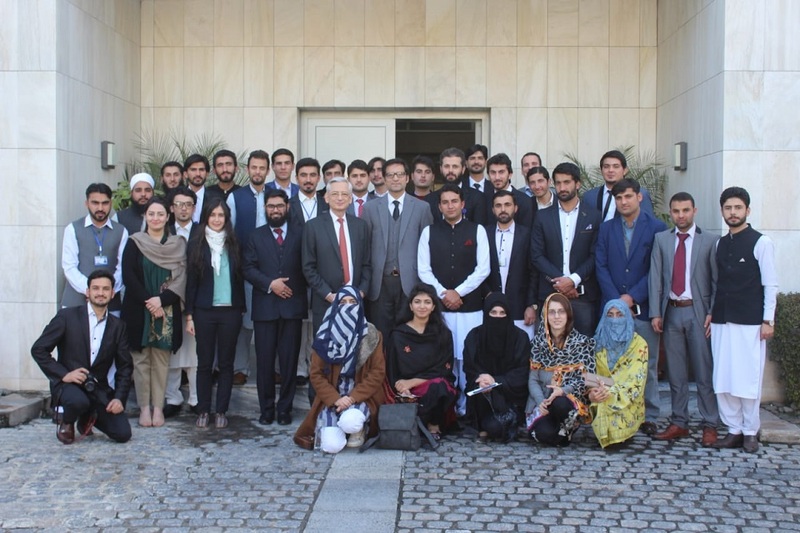 The students of the Institute of Peace and Conflict Studies, University of Peshawar, mostly from KP and tribal areas, called upon the French Ambassador to Pakistan, his excellency Dr. Marc Barety today at French Embassy, Islamabad. His excellency Dr. Marc very warmly welcomes the students for outreaching to French Embassy. He delivered an hour long presentation on the history of France and French involvement in Pakistan. He also elaborated how France and Germany, the previous arch enemies, learned to co-exist and become warmy buddies after the WW-II. "You don't th build the future on gathered", he emphasized. France is the largest tourist destination with 80 million annual tourists, he added. France is also headquarter to UNESCO and OECD, he added. He pointed out four major positive points for Pakistan, youth population, rising middle class, education, and IT. He added that France is offering 400 scholarships annually. He encouraged the students to choose France for their higher studies as France is ranked at No. 2 in Shanghai ranking. Prof. Soherwordi thanked the Ambassador for sparing his precious moments to interact with the students of IPCS, University of Peshawar. They invited him to reopen French classes at the University of Peshawar. Prof.Dr. Syed hussain Shaheed Soherwordi the director of the institute of peace and conflict studies said that the two countries are direly needed to develop strong relations for curbing terrorism and supporting peace efforts in the world. He said that the French classes at the IPCS will be a great service to the people of the KP and merged districts. He also requested the ambassador to visit the IPCS for a long chat with the staff and students of the University of Peshawar.